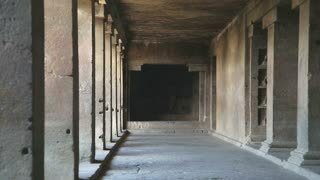 Tourists passing through the rooms of Aurangabad caves. AURANGABAD, INDIA - 14 JANUARY 2015: Indian family passing through rooms of Aurangabad caves. 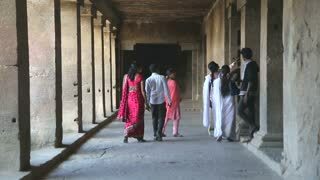 AURANGABAD, INDIA - 14 JANUARY 2015: Family passing through rooms of Aurangabad caves. AURANGABAD, INDIA - 14 JANUARY 2015: Tourists passing by the columns of Aurangabad caves. 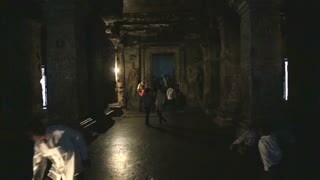 AURANGABAD, INDIA - 14 JANUARY 2015: Tourists passing through the halls of Aurangabad caves. 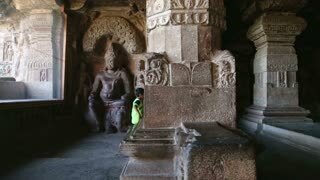 AURANGABAD, INDIA - 14 JANUARY 2015: Tourists passing through the rooms of Aurangabad caves.